The customer says the fault with this ECU is that the vehicle would start and run but cut out after 30 seconds. A local dealership ran some diagnostics and suspect that the ECU is causing the problem. The customer has sent the ECU away but it came back as a non-repairable unit and so has decided to send to us for a second opinion. We have found the unit is heavily water damaged and has many corroded joints but the PCB and tracks were okay. We were able to remove all components, clean the PCB and tracks before installing all components again and reworking the solder. Some components failed and did require replacement but eventually we were able to get full communication with the unit. A full test showed corrupted injector drivers in the external flash memory so we reflashed the ECU and the unit then passed all tests on our testing rig. 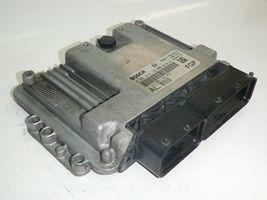 This particular unit is a Bosch EDC16C39 Engine ECU and we are able to fully test & rebuild these units. We can even repair ECU’s where others have failed. If you have a Fiat Doblo 1.9JTD with a suspected ECU fault then get in contact today. You can email us, drop in or call on 0208 853 5000. This entry was posted in Repaired ECU's and tagged Fiat Doblo ECU Faults, Fiat Doblo ECU Problems, Fiat Doblo ECU Repairs by smartAjaz. Bookmark the permalink.